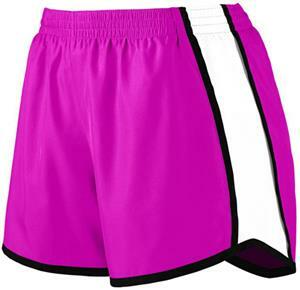 Augusta Sportswear Ladies' Jr Fit Pulse Team Short. Liner wicks moisture away from the body. Junior fit. Low rise. Covered elastic waistband with inside drawcord. Inner brief with leg elastic. Inside key pocket. Mesh inserts on panel. 4-inch inseam. Contrasting self fabric binding on side panels and hem. Waist (on half) 14 1/2" 15" 15 3/4" 16 5/8" 17 5/8"
Hip (on half) 20 3/4" 21 3/4" 23 1/4" 25" 27"
Great shorts for over the top of spandex.